Placemaking is the connective tissue that strengthens the bond between people and place. In essence, it helps create a sense of belonging by “paying particular attention to the physical, cultural, and social identities that define a place and support its ongoing evolution,” as The Project for Public Spaces (PPS) articulates so well. “Paying particular attention to the physical, cultural, and social identities that define a place and support its ongoing evolution,” as The Project for Public Spaces (PPS) articulates so well. “Simple” doesn’t have to be “boring,” by the way. Take The Langston for example, a residential community on Cleveland State University’s campus. The interior and exterior signage and graphics program is paired with illuminated logos and a parking lot entry monument. The colorful banners set the stage for a lively and sociable space inside, teasing the brand experience before you even step through the door. 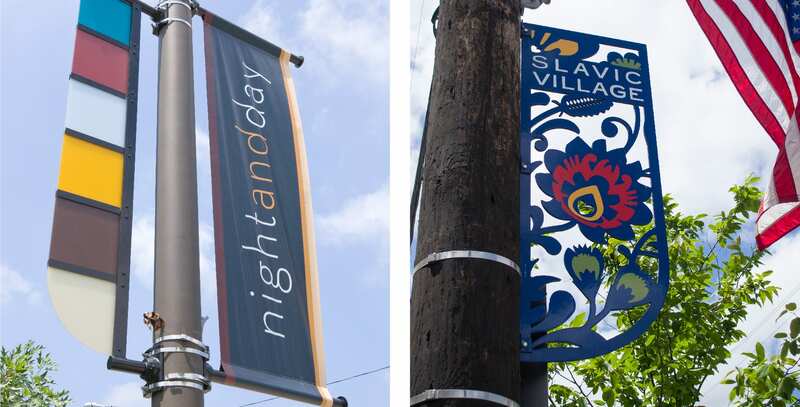 According to PPS, “placemaking inspires people to collectively reimagine and reinvent public spaces as the heart of every community.” Luckily, banners are malleable in their size and shape, giving organizations options to capitalize on a neighborhood’s best and brightest assets. The City of South Euclid is a family-friendly inner-ring Cleveland suburb proud of its strong community base and cultural diversity. Though still recovering from the economic downturn, South Euclid is working to drive vacant home renovation efforts and the transformation of empty lots into community gardens. Harnessing a progressive long-term view, city leaders selected a “Come Together & Thrive” logo and tagline that speaks to their sustainability-minded efforts and helps attract and align with current and prospective residents who would appreciate what South Euclid has to offer. Guide Studio designed a placemaking program around this theme, including metal and cloth banners installed along the downtown thoroughfare. We often recommend banner programs to organizations lacking the ground space for more robust signage. Banners are also a means of welcoming pedestrians into a busy streetscape or other public space. For instance, Guide Studio took a hands-on approach in activating Downtown Kent’s brand identity, designing signage that embraces the city’s brand under a common theme of “Kent Speaks.” Today, a colorful banner system expresses the community’s growth, guiding travelers through a bustling space brimming with restaurants and storefronts. The City of Kent now champions its new downtown identity to cement its rising visitor destination status. In addition to being an effective placemaking tool, banners are also a less expensive way to enhance your place. In fact, since banners can be done affordably, they can also be updated from time to time to support a rebrand, new initiative, or resonate with a timely communications campaign. Depending on size and materials, a single banner costs roughly $500-$800 for fabric or $1,000-$1,500 for aluminium. Fabric banners are easy to produce, replace, or rotate seasonally to accommodate updates to the messaging, look and feel; while aluminium banners are more permanent and don’t need to be replaced as often. These are best used when you intend to create an evergreen brand banner that will stand the test of time. They are also a little more aesthetically pleasing and can be dimensional, use transparencies, cut-outs, etc. Both are good options, but serve different purposes. Banners provide organizations a defined entry point to their place, particularly when signage space or budget is limited. University Heights tasked Guide Studio with a brand and logo redesign to advance the brand and help the east side suburb stand out among its neighboring communities. Research and multi-day discovery sessions uncovered the community’s goals and personality, resulting in a “mosaic” brand theme that demonstrates University Heights’ eclectic nature alongside the various features that make the city unique. A new shield-shaped logo symbolizes the community’s historic homes and educational institutions, and sets guidelines for a larger brand launch that could include banner programs and additional branded placemaking opportunities. Ultimately, banner projects are key elements in transforming public spaces into vibrant community places, whether public squares, streets, sidewalks or the myriad other outdoor and indoor amenities that have public uses in common. An effective program connects people to place, from visitors traveling through a space, to residents seeking an increased sense of community pride. The best banner programs brand a community on all levels, leaving your audience with warm and positive feelings long after they’ve moved on with their day. Are you considering a banner program? Give us a shout and we will answer your questions.